Soup has lost its relevance as a convenient meal alternative. Consumers do not perceive soup in a can to be made with real ingredients and consequently consumers are moving away from canned soups. Get consumers to positively reappraise Campbell's soup through trial of the product. Consumers tried the soup from Campbell's fresh stand before revealing it was made from a can. The stand operated at 6 malls in NSW & VIC across 6 weeks (Wed-Sun). 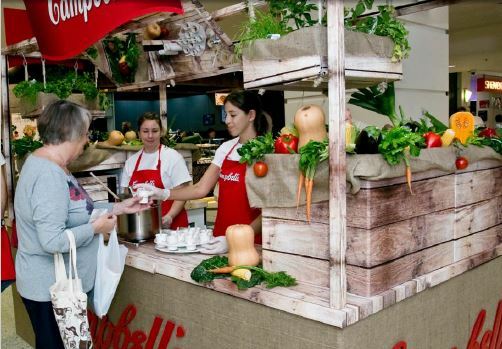 The Campbell's stand distributed 157,880 samples across 6 malls. The team hand recorded 1,755 unit sales in the closest supermarket to the stand across the 6 weeks. Averaging 59 sales per day, this was 9 units per day above the set KPI of 50 units per day. 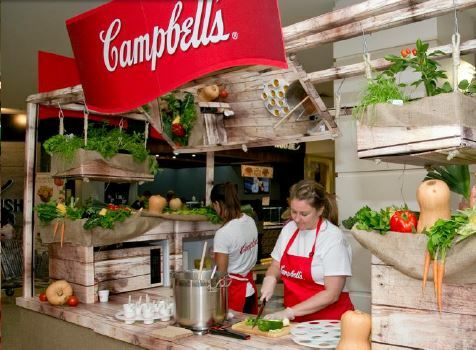 Team 5iveSenses completed an Experiential Marketing campaign for Campbell’s soup, by encouraging consumers to positively reappraise Campbell’s Soup through trial of the product. This brief article outlines an overview of the campaign including the challenge, solution and finally the results. The campaign was activated during June 2015.